A truck or lorry is a motor vehicle designed to transport cargo. Trucks vary greatly in size, power, and configuration; smaller varieties may be mechanically similar to some automobiles. Commercial trucks can be very large and powerful and may be configured to be mounted with specialized equipment, such as in the case of refuse trucks, fire trucks, concrete mixers, and suction excavators. Strictly speaking, a commercial vehicle without a tractor or other articulation is a "straight truck" while one designed specifically to pull a trailer is not a truck but a "tractor". Although it had been invented in 1897, the diesel engine did not appear in production trucks until Benz introduced it in 1923. 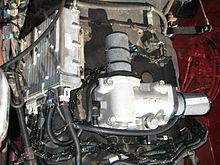 The diesel engine was not common in trucks in Europe until the 1930s. In the United States, Autocar introduced diesel engines for heavy applications in the mid-1930s. Demand was high enough that Autocar launched the "DC" model (diesel conventional) in 1939. However, it took much longer for diesel engines to be broadly accepted in the US: gasoline engines were still in use on heavy trucks in the 1970s. Truck is used in American English, and is common in Canada, Australia, New Zealand, Puerto Rico, Pakistan and South Africa, while lorry is the equivalent in British English, and is the usual term in countries like the United Kingdom, Ireland, Malaysia, Singapore, and India. "Lorry" has a more uncertain origin, but probably has its roots in the rail transport industry, where the word is known to have been used in 1838 to refer to a type of truck (a goods wagon as in British usage, not a bogie as in the American), specifically a large flat wagon. It probably derives from the verb lurry (to pull, tug) of uncertain origin. Its expanded meaning, "self-propelled vehicle for carrying goods", has been in usage since 1911. Before that, the word "lorry" was used for a sort of big horse-drawn goods wagon. Light trucks are car-sized (in the US, no more than 13,900 lb (6.3 t)) and are used by individuals and businesses alike. In the EU they may not weigh more than 3.5 t (7,700 lb), and are allowed to be driven with a driving licence for cars. Pickup trucks, called utes in Australia and New Zealand, are common in North America and some regions of Latin America, Asia and Africa, but not so in Europe, where this size of commercial vehicle is most often made as vans. Fuso Canter 3C13, 8th Generation in Spain. Road damage and wear increase very rapidly with the axle weight. The number of steering axles and the suspension type also influence the amount of the road wear. In many countries with good roads a six-axle truck may have a maximum weight of 44 t (97,000 lb) or more. Australia has complex regulations over weight and length, including axle spacing, type of axle/axle group, rear overhang, kingpin to rear of trailer, drawbar length, ground clearance, as well as height and width laws. These limits are some of the highest in the world, a B-double can weigh 62.5 t (138,000 lb) and be 25 m (82 ft) long, and road trains used in the outback can weigh 172 t (379,000 lb) and be 53.5 m (176 ft) long. Uniquely, the State of Michigan has a gross vehicle weight limit of 164,000 pounds (74,000 kg), which is twice the U.S. federal limit. Although it is contended that this is one reason why Michigan has the worst roads in the country (along with lack of funding -- Michigan is dead last among the fifty states[A]), a measure to change the law was just defeated in the Michigan Senate. 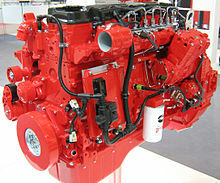 A significant proportion of North American manufactured trucks use an engine built by the last remaining major independent engine manufacturer (Cummins) but most global OEMs such as Volvo Trucks and Daimler AG promote their own "captive" engines. In the European Union, all new truck engines must comply with Euro VI emission regulations. As of 2019[update] several alternative technologies are competing to displace the use of diesel engines in heavy trucks. CNG engines are widely used in the US refuse industry and in concrete mixers, among other short-range vocations, but range limitations have prevented their broader uptake in freight hauling applications. Heavy electric trucks and hydrogen-powered trucks are still in the prototype and field-testing stages, although media reports indicate that there is substantial interest in them from major freight haulers. The frame is usually made of steel, but can be made (whole or in part) of aluminum for a lighter weight. A tow bar may be found attached at one or both ends, but heavy tractors almost always make use of a fifth wheel hitch. Refrigerator trucks have insulated panels as walls and a roof and floor, used for transporting fresh and frozen cargo such as ice cream, food, vegetables, and prescription drugs. They are mostly equipped with double-wing rear doors, but a side door is sometimes fitted. Largest non-American truck manufacturers in the world as of 2015. Driving licensing has been harmonized throughout the European Union (and practically all European non-member states), so that common rules apply within Europe (see European driving licence). As an overview, to drive a vehicle weighing more than 7.5 t (16,500 lb) for commercial purposes requires a specialist license (the type varies depending on the use of the vehicle and number of seats). For licenses first acquired after 1997, that weight was reduced to 3.5 t (7,700 lb), not including trailers. There are around 5 million truck drivers in India. In the United States, a commercial driver's license is required to drive any type of commercial vehicle weighing 26,001 lb (11.8 t) or more. The federal government regulates how many hours a driver may be on the clock, how much rest and sleep time is required (e.g., 11 hours driving/14 hours on-duty followed by 10 hours off, with a maximum of 70 hours/8 days or 60 hours/7 days, 34 hours restart ) Violations are often subject to significant penalties. Instruments to track each driver's hours must sometimes be fitted. In 2006, the US trucking industry employed 1.8 million drivers of heavy trucks. There is a shortage of willing trained long distance truck drivers. Part of the reason for the shortage is the economic fallout from deregulation of the trucking industry. Michael H. Belzer is an internationally recognized expert on the trucking industry, especially the institutional and economic impact of deregulation. He is an associate professor, in the economics department at Wayne State University. He is the author of Sweatshops on Wheels: Winners and Losers in Trucking Deregulation (Oxford University Press, 2000). His major opus was critically well received. Low pay, bad working conditions and unsafe conditions have been a direct result of deregulation. "[This book] argues that trucking embodies the dark side of the new economy." "Conditions are so poor and the pay system so unfair that long-haul companies compete with the fast-food industry for workers. Most long-haul carriers experience 100% annual driver turnover. As the Atlanta Journal-Constitution wrote: "The cabs of 18-wheelers have become the sweatshops of the new millennium, with some truckers toiling up to 95 hours per week for what amounts to barely more than the minimum wage. [This book] is eye-opening in its appraisal of what the trucking industry has become." Trucks contribute to air, noise, and water pollution similarly to automobiles. Trucks may[vague] emit lower air pollution emissions than cars per equivalent vehicle mass, although the absolute level per vehicle distance traveled is higher, and diesel exhaust is especially dangerous for health. EPA measures pollution from trucks. With respect to noise pollution, trucks emit considerably higher sound levels at all speeds compared to typical cars; this contrast is particularly strong with heavy-duty trucks. There are several aspects of truck operations that contribute to the overall sound that is emitted. Continuous sounds are those from tires rolling on the roadway, and the constant hum of their diesel engines at highway speeds. Less frequent noises, but perhaps more noticeable, are things like the repeated sharp-pitched whistle of a turbocharger on acceleration, or the abrupt blare of an exhaust brake retarder when traversing a downgrade. There has been noise regulation put in place to help control where and when the use of engine braking retarders are allowed. Concerns have been raised about the effect of trucking on the environment, particularly as part of the debate on global warming, so many countries are lowering limits on truck CO2 emissions. A 60-ton tractor & trailer at 80 km/h needs 168 kW : 41% (68 kW) to overcome the rolling resistance, 38% (64 kW) for the aerodynamic drag, 9% (15 kW) for the auxiliaries, 7% (12 kW) for the driveline & tire and 6% (10 kW) is lost in uphill/downhill hysteresis. A truck cab is a hazard control that protects the truck operator from hazardous airborne pollutants. 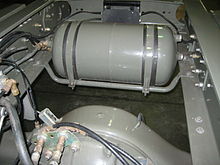 As an enclosure, it is an example of an engineering control. Enclosed operator cabs have been used on agriculture, mining, and construction vehicles for several decades. Most modern day enclosed cabs have heating, ventilation, and air conditioning (HVAC) systems for primarily maintaining a comfortable temperature and providing breathable air for their occupants. Various levels of filtration can be incorporated into the HVAC system to remove airborne pollutants such as dusts, diesel particulate matter (DPM), and other aerosols. Two key elements of an effective environmental enclosure are a good filtration system and an enclosure with good integrity (sealed isolation from the outside environment). It is recommended that a filtration system filter out at least 95% or greater of airborne respirable aerosols from the intake airflow, with an additional recirculation filtering component for the inside air. Good enclosure integrity is also needed to achieve positive pressure to prevent wind-driven aerosol penetration into the enclosure, as well as to minimize air leakage around the filtration system. Test methods and mathematical modeling of environmental enclosures are also beneficial for quantifying and optimizing filtration system designs, as well as maintaining optimum protection factor performance for enclosure occupants. In the UK, three truck shows are popular – Shropshire Truck Show at Oswestry Showground during May, The UK Truck Show held in June at Santa Pod Raceway, and FIA European Drag Racing Championships from the home of European Drag-Racing. The UK Truck Show features drag-racing with 6-tonne trucks from the British Truck Racing Association, plus other diesel-powered entertainment. ^ It is to be noted that Michigan has some of the highest gas prices, but that those taxes are not spent on highways, but are diverted into the state's general fund. ^ "Truck History". About.com. Retrieved 6 September 2008. ^ "Autocar, Always up, Our History". Autocar, LLC. Retrieved 21 October 2018. ^ "Debut of diesel engines in tractors and trucks". Daimler AG. Retrieved 27 September 2018. ^ Davies, Peter J. (2000). The World Encyclopedia of Trucks. Lorenz Books. pp. 20–21, 114, 118, 160, 204. ISBN 0-7548-0518-2. ^ Motor's Truck and Diesel Repair Manual (26 ed.). Motor. 1973. pp. 530, 1035. ISBN 0-910992-16-9. ^ "The First Ute". ABC – Radio Australia. Retrieved 15 June 2012. ^ "49CFR571". Retrieved 31 January 2018. ^ "An ALMA Antenna on the Move". ESO Picture of the Week. Retrieved 16 July 2012. ^ a b "Heavy Vehicle (Mass, Dimension and loading) National Regulation Schedule 1 (NSW)". New South Wales Government. Retrieved 5 August 2016. ^ a b "Heavy Vehicle (Mass, Dimension and loading) National Regulation Schedule 6 (NSW)". New South Wales Government. Retrieved 5 August 2016. ^ a b "Council Directive 96/53/EC laying down for certain road vehicles circulating within the Community the maximum authorized dimensions in national and international traffic and the maximum authorized weights in international traffic". EUR-Lex. Retrieved 5 August 2016. ^ "Freight Management and Operations: Bridge Formula Weights". US Department of Transportation. 21 May 2015. Retrieved 26 May 2015. ^ Harborn, Mats; Feng, Feng; Xu, Tommy (2013). "Chinese Road Transport Mass and Dimensions Regulations – An Analysis of the Challenges Ahead". 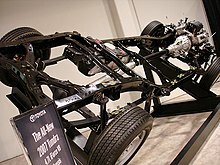 road-transport-technology.org. Retrieved 6 August 2016. ^ "Trafikförordningen". Riksdagen. Retrieved 3 March 2017. ^ "Moving goods by road". HM (UK) Revenue & Customs. 5 April 2016. Retrieved 5 August 2016. ^ "A Guide to Haulage & Courier Vehicle Types & Weights" (PDF). Returnloads.net. Retrieved 5 August 2016. ^ "Federal Size Regulations for Commercial Motor Vehicles". US Department of Transportation. Retrieved 5 August 2016. ^ "Compilation of Exixting State Truck Size and Weight Limit Laws". US Department of Transportation. May 2015. Retrieved 7 August 2016. ^ a b Egan, Paul (13 March 2018). "Does your body ache from hitting potholes? 5 reasons Michigan has lousy roads". Detroit Free Press. Retrieved 16 April 2019. ^ Anderson, Bill (17 August 2018). "Michigan's Road Spending: How do we stack up?". Southeast Michigan Council of Governments. Retrieved 16 April 2019. ^ Haddad, Ken (22 February 2018). "Pothole questions: Why are Ohio's roads better than Michigan's roads? MDOT points to lack of funding compared to Ohio". Retrieved 16 April 2019. ^ Oosting, Jonathhan (2 December 2014). "Michigan road funding: Proposal to cut truck weight limits fails in state Senate". MLive. Retrieved 16 April 2018. ^ a b "Pavement Comparative Analysis Technical Report Comprehensive Truck Size and Weight Limits Study" (PDF). U.S. Department of Transportation, Federal Highway Administration. 15 June 2015. ^ Egan, Paul (19 April 2019). "Experts weigh in on how much Michigan's heavy trucks damage the state's roads". Detroit Free Press. Retrieved 21 April 2019. ^ Egan, Paul (1 March 2019). "Fixing Michigan's crumbling roads: What about the heavy trucks?". Detroit Free Press. Retrieved 21 April 2019. ^ Davies (2000), pp. 58–61. ^ Bernstein, Adam (29 January 2008). "Viktor Schreckengost; Designed Bicycles, Dinnerware and More". The Washington Post. Retrieved 26 May 2010. ^ Operators Handbook-DM, DMM, U Series. Mack Trucks. 1988. pp. 62–64. ^ "EU: Heavy-Duty Truck and Bus Engines". DieselNet. November 2016. Retrieved 15 October 2017. ^ "Want a Nikola hydrogen-electric truck? You will have to wait". FreightWaves. 17 April 2019. ^ Davies (2000), pp. 30–31. ^ "Concrete Mixers (company site)". McNeilus. 2016. Retrieved 24 September 2016. ^ "Truck Mixers Summary (Sales Brocure)" (PDF). Stetter. 2016. Retrieved 24 September 2016. ^ Davies (2000), pp. 34–35. ^ "Dump Truck Operator Manual" (PDF). Galion-Godwin Truck Body Co. Retrieved 13 September 2016. ^ Davies (2000), pp. 28–29. ^ Davies (2000), pp. 32–33. ^ Davies (2000), pp. 46–47. ^ "HDR 70/85 Wrecker Operations and Maintenance Manual" (PDF). Jerr-Dan. 2010. Retrieved 13 September 2016. ^ "Owner's Manual 820 Wrecker/FIIIT" (PDF). Miller Industries. 1997. Retrieved 13 September 2016. ^ "Annual Report 2015". Daimler. 2016. Retrieved 25 September 2016. ^ "Form 10K Navistar International Corp". US Securities and Exchange Commission. 2016. p. 48. Retrieved 24 September 2016. ^ "2015 Annual Report" (PDF). Dongfeng. 2016. p. 10. Retrieved 25 September 2016. ^ "70th Annual Report 2015-2015" (PDF). Tata. 2016. p. 53. Retrieved 24 September 2016. ^ "Annual and Sustainability Report 2015" (PDF). Volvo. 2016. p. 91. Retrieved 25 September 2016. ^ "Annual Report 2015" (PDF). Volkswagen. 2016. p. 98. Retrieved 25 September 2016. ^ "Financial Reports for the Fiscal Year Ending" (PDF). Hino Motors. 2016. p. 25. Retrieved 25 September 2016. ^ "2015 Annual Report" (PDF). PACCAR. 2016. p. 28. Retrieved 25 September 2016. ^ "2015 Annual Report" (PDF). CNH. 2016. p. 60. Retrieved 23 October 2016. ^ "South Australia License class information". Gov't of South Australia. Retrieved 28 July 2016. ^ "Indian Truckers Strike to Protest Against Fuel Price Hike". Deutsche Welle. 2 July 2008. ^ "Commercial Drivers License". National Highway Traffic Safety Administration. Retrieved 21 May 2008. ^ "Hours of Service Rules". US Federal Motor Carrier Safety Administration. 18 December 2014. Retrieved 26 May 2015. ^ "Truck Drivers and Drivers/Sales Workers". Occupational Outlook Handbook. Bureau of Labor Statistics, U.S. Department of Labor. 18 December 2007. Retrieved 25 January 2008. ^ Morris, Frank (11 February 2019). "Facing A Critical Shortage Of Drivers, The Trucking Industry Is Changing" (Audio). Morning edition. National Public Radio. Retrieved 17 April 2019. ^ a b "Sweatshops on Wheels". Oxford University Press. July 2000. Retrieved 17 March 2012. ^ Belzer, Michael H. (24 August 2000). Sweatshops on Wheels: Winners and Losers in Trucking Deregulation (Hardcover). Oxford University Press, USA. p. 272. ISBN 0-19-512886-9. ISBN 978-0-19-512886-4. ^ "Sweatshops on Wheels," U.S. News and World Report. ^ "Heavy-Duty Truck and Bus Engines". dieselnet.com. Retrieved 6 September 2008. ^ C. Michael Hogan (1973). "Analysis of highway noise". Springer Science+Business Media. pp. 387–392. doi:10.1007/BF00159677. ^ "EU countries agree to 30 percent cut in truck CO2 emissions". Reuters. 20 December 2018. ^ "U.S. Domestic Freight Transportation". United States Department of Energy. Archived from the original on 22 September 2008. Retrieved 6 September 2008. ^ "How Government policy can realize rail freight's role in reducing carbon emissions". FreightOnRail.org.uk. Retrieved 6 September 2008. ^ Nils-Olof Nylund (2013). "Vehicle energy efficiencies" (PDF). VTT Technical Research Centre of Finland. ^ a b Organiscak, J.; Cecala, A.; Hall, R. (June 2018). "Design, Testing, and Modeling of Environmental Enclosures for Controlling Worker Exposure to Airborne Contaminants". U.S. National Institute for Occupational Safety and Health. Retrieved 9 November 2018. ^ "Trucking Industry Operating Taxes State of Georgia". Retrieved 18 August 2006. ^ "Road wear from heavy vehicles – an overview" (PDF). NVF committee Vehicles and Transports. August 2008. Retrieved 27 September 2016. ^ "Shropshire Truck Show". shropshiretruckshow. Retrieved 20 August 2015. Wikimedia Commons has media related to Truck. Hutchinson, Jr., Rollin W. (January 1912). "Motor Trucks – The New Freighters: Quicker And More Reliable Service, Cleaner And Less Congested Cities, Concrete Examples Of Saving". The World's Work: A History of Our Time. XXIII: 268–187. Retrieved 10 July 2009. This page was last edited on 22 April 2019, at 09:16 (UTC).